So how does one come to find themselves in the business of renting reusable plastic moving boxes? I mean, the idea of renting reusable moving crates instead of purchasing cardboard boxes seems so revolutionary and yet so simple, you should have thought of it yourself, right? Well, few people get to share about the actual sweat, sacrifices, struggles, and time that goes into bringing a great idea to market, so we appreciate your interest. Our story begins back in 2011 with our residential and office moving company, Professional Movers.com. We had just celebrated our 33rd year of being in business, which is an amazing feat when you learn that statistically 50% of all businesses fail within their first 5 years. We had persevered through the 70s, 80s, 90s, and even managed to survive the 2008 housing bubble which crushed the Moving Industry, causing many of our competitors to close-up shop. Over the course of our company history, one thing always remained constant… our effort to continuously seek and implement new ways to improve a customer’s move experience. That was the differentiator that helped us build a reputation for providing award-winning quality moving services in the Detroit market. We were voted as the “Best Moving Service” by Readers of the Oakland Press for five consecutive years. For instance, customer’s wanted more accurate pricing in advance of the move, so we assigned a Moving Consultant to visit every home or office to review each project in person. Our pre-move visitations allowed us to improve accuracy of pricing and ensure that there would not by any pricing surprises on move day. But we didn’t just stop there! Customers wanted convenience so we tailored to their needs and began scheduling appointments from morning to evening and weekends. They also wanted quick turnaround on pricing so we embraced technology and built our own moving software that helped our Moving Consultants speed up the creation and electronic delivery of our estimates. The good news for Professional Movers.com was that the Moving Industry back then and even today was antiquated. It was a true throwback in time, stuck in settling for status quo. All of the positive things we were doing that might seem obvious and small in any other industry, were nothing short of miraculous and was putting us miles ahead of competition in the moving industry. If something was important to our customers, we made sure to be flexible and agile so we were able to make decisions quickly to immediately implement changes. We began offering better protection of customers’ homes by using floor and door protection on every move. On several occasions, we delivered a customer’s unwanted food to local food banks for free. Our intelligent, friendly, skilled movers did things so positively different, they forever altered a customer’s expectations for the better. At that point, we were extremely proud of how far we had come, but we were inspired by the positive feedback to continue improving in any way we could. So, in January 2011, we continued to do what we did best, we listened to our customers for more opportunities to improve their experience. This time, the customer dilemma came from an iconic Detroit based company who hired us to move their offices. The move consisted of relocating the belongings of over 500 of their employees. They shared that their last move had required thousands of cardboard boxes that were hard for their employees to assemble and pack. In addition, since there was not a need for the cardboard boxes after they unpacked, many of the boxes were thrown away following the move. Our team immediately began working on a greener, simpler solution. We had read about the use of plastic moving boxes in Europe that dated back to the 1960s. The European moving companies or “removal” companies as they are called, were early adopters to offer alternatives to the cardboard box and the use of plastic moving boxes were wildly successful. However, here in the United States, the use of plastic moving boxes was still in its infancy stage with only a handful of companies offering rental. We sourced a vendor and rented 2,000 plastic moving boxes for our office customer. To our customer’s delight, we delivered the plastic moving boxes fully assembled. There was no need for their employees to assemble any cardboard boxes. This drastically decreased their downtime associated with packing. As a bonus, the plastic moving boxes fit perfectly on a set of wheeled dollies. This made them mobile and able to easily roll from the office to the moving trucks. The mobility streamlined the moving process allowing us to reduce the normal manpower and trucks typically needed to move 500 employees. Less movers, less trucks, and less move time meant less overall costs for our customer. It only took that one office job to make our entire team believers of using reusable plastic moving boxes instead of cardboard. We realized if the use of plastic moving boxes could have such a positive impact for our office moving clientele, then they would certainly help simplify the experience for residential customers as well. After all, try to find anyone who has packed their house that believes taping together and packing all those expensive cardboard boxes to be a pleasant and easy going experience. And we won’t even begin to mention the significant amount of cardboard waste sent to the landfill after you unpack. In searching for an answer to one customer’s problem, we had discovered a solution that had the potential to positively disrupt the moving industry and make packing and moving easier for everyone while being better for the environment. We knew we were on the cusp of something big; we had hit our light-bulb moment. However, as Thomas Edison said, “Ideas are not enough. Genius is 1% inspiration, 99% perspiration.” It was time for the real work to begin. We wanted to be the first to make reusable plastic boxes available to everyone in the Southeast Michigan area and we made it our goal to convert our idea to life. We immediately began working on a business plan to identify and understand the significant investment it would take to launch a plastic moving box rental business. Crunching numbers, we quickly discovered that without the support and existing structure of Professional Movers.com, it would take years to see profitability for our new adventure. There were many things that we had right at our fingertips including a facility, trucks, and teams to provide delivery and clean the returning inventory of plastic moving boxes. These things take money, not to mention, the cost to manufacture the plastic moving boxes, design a logo, obtain a trademark, establish an online presence, build out an ecommerce website, and advertise. On the flip side, had we decided to move forward and launch a plastic moving box rental business utilizing Professional Movers.com resources and capital, it would come with great risk. From a capital standpoint, at Professional Movers.com we have always practiced controlled, steady, conservative growth. We try to mitigate borrowing outside money from banks as much as possible by reinvesting any profits from the previous year back into our business. For instance, each year we try to add at least one new moving truck to our fleet. Our research and conversations with the plastic box manufacturers revealed that the cost to purchase an inventory of plastic moving boxes needed to launch a rental business was equal to the cost of purchasing a few moving trucks. Purchasing our inventory of plastic moving boxes meant forgoing the purchase of any moving trucks that year. In terms of resources, starting a plastic moving box rental company under Professional Movers.com meant utilizing our same team members to help assist with day-to-day operations for the new business venture. The worry of what harm could be brought to our existing business by dedicating our current resources to the new business was something we had to consider. There were obvious synergies such as the Moving Consultants being able to help process orders, but there were also less efficient synergies such as needing to dedicate a significant part of our warehouse space and warehouse manager’s time to keep track of and clean the inventory of plastic containers. After weighing our options, we decided to leverage and harness the capabilities of Professional Movers.com and launch a reusable plastic box rental company, because we believed providing a better, easier, cheaper, and more environmentally friendly alternative to cardboard boxes was important enough for us to do it, even if it meant risking everything that we had spent 33 years building. So in January 2011, Rental Crates.com was born as an internal plastic moving box rental division of Professional Movers.com. Our plan was to start slow focusing first on the commercial and office moving market and eventually expand into providing service to residential customers when we could afford to expand. Since Professional Movers.com already had an existing pipeline of corporate clients that were under contract for our office moving services, we purchased just enough rental crates to service their accounts directly. This minimized our initial investment to be as lean as possible, allowing us to launch our new venture while still having available capital to put toward maintenance and growth of our moving company and our Rental Crates brand. Within the first year, we were able to generate enough revenue by renting our Rental Crates to completely pay off the production costs from our original first batch of plastic boxes. This reassured our belief that there was a market for Rental Crates.com to become a viable standalone brand. Shortly after, we confidently doubled down and purchased another batch of Rental Crates from the manufacturer. In February 2012, we registered Rental Crates.com as an assumed name through the State of Michigan and rolled out the social marketing of the brand after we had secured the trademark of our logo from the United States Patent and Trademark office. About this same time, the City of Detroit had begun an incredible resurgence with people and businesses beginning to move back to its urban core. At the epicenter of the renaissance was a local businessman, Dan Gilbert, who had poured nearly $2 billion of his own money into revitalization efforts, even moving thousands of team members from his Family of Companies to downtown. At the heart of his efforts, he was purchasing many older and largely unoccupied buildings, renovating them, and bringing the structures back to life. His buildings became canvas for the creation of inspiring workspaces. Those workspaces began to attract corporate tenants who smartly were willing to relocate their businesses to Detroit to woo the talented millennials who wanted to work in the exciting urban area. The new flux of people and businesses relocating to the city meant that there would be a growing need for both our moving services and the use of Rental Crates in Detroit. In April 2012, Professional Movers.com joined the first wave of businesses to open an office downtown. Our space inside the Chrysler House and later 1001 Woodward, made it easy for us to rent, deliver, and pick-up our Rental Crates to companies moving to downtown Detroit. As the city continued to thrive and grow with new businesses, we too grew and perfected the rental process for our office customers. During these rentals, countless employees for the companies that were using our Rental Crates would send praises of how easy Rental Crates made it to pack and move. We started fielding many phone calls and emails from those same employees who wished to rent our Rental Crates for their personal home moves. It had now been nearly four years since our initial launch and we still hadn’t fully launched into servicing the residential market with our Rental Crates.com. Remember, our plan with this new venture was slow and steady growth. This allowed us the ability to leverage our resources without stretching ourselves too thin. It also enabled us the ability to focus closely on refining and mastering the needs for our office customers. In 2014 we began selectively testing the residential market and started working with some residential customers on a limited basis. We used these select residential rentals as an opportunity to learn what worked, what didn’t work, and what our residential customers found most important. Often, we would provide free usage of our plastic moving boxes in exchange for their candid feedback. We wanted to hear the good, the bad, and the ugly. Thankfully, they did not hold back and their stories helped us prepare for an official launch into the residential market.More importantly, we believe if we didn’t take the slow approach and take the time to learn from our residential customers, we would have missed the audience completely and it was very possible Rental Crates.com would not exist today. Simple things like the residential customers sharing that they needed smaller sized crates saved us hundreds of thousands of dollars by not purchasing the wrong size containers. Instead, we developed and manufactured specific multiple sized containers that address the variety of different sized items most commonly found in a house. We invested heavily in our ordering system to automate our process. We built out the best ecommerce website that allows residential customers to instantly place rental orders online. We even help our residential customers better decide how many Rental Crates they would need by offering bundled packages. 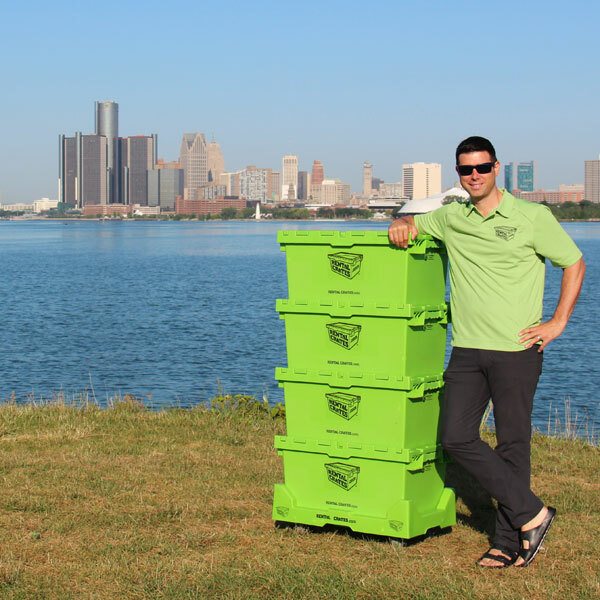 Fast-forward to today and Rental Crates.com has grown to become the dominant supplier of thousands of plastic reusable moving boxes to people moving their homes or businesses in the Detroit Market. The Rental Crates.com brand has officially stepped out of the shadows of Professional Movers.com and has helped kick start a revolution to change the way people in the United States pack and move. Special thank you to our Team Members, Customers, Friends, and Family who have made Rental Crates.com’s success possible.